Building Information Modelling (BIM) describes the process of designing a building collaboratively using one digital system of computer 3D models rather than as separate sets of drawings. The model can be used by the project design team, construction team and passed to the building owner. BIM improves collaboration and ensures a higher of control over projects of all sizes and complexity. It offers potential saving in cost and time, greater accuracy in estimation, and the avoidance of design collisions, resulting in limited alterations, and rework due to information loss. BIM also encourages sharing with architects, builders and the end customer to make decisions at an early stage in the building process. 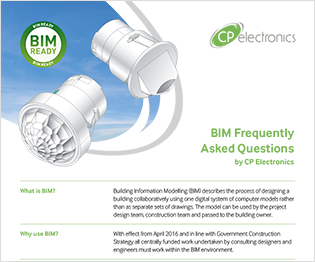 At CP Electronics we believe that within the next few years, the use of BIM is going to increase within all sectors, this includes: central government projects, local authorities and the private sector. Therefore, we have embraced BIM to help with the integration and exchange of information with our customers. REVIT is the preferred software platform to provide our extensive portfolio in BIM ready format. CP Electronics has worked with bimstore, one of the leading authorities on BIM in the industry, to develop and bring our offering to market. Bimstore is part of the BIM technologies group and has worked with BIM for over 10 years. Their Autodesk Certified professionals have checked our BIM content and all components are ready for use in real project environments. We are certified for the production of BIM Objects and associated Product Data.